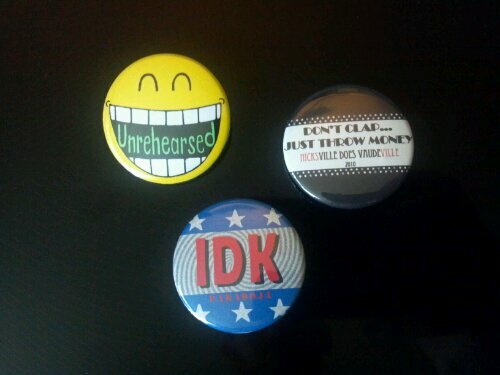 Buttons from 3 shows that I’ve directed. They attract attention, and by extension, so does your show. So you have a show coming up (which I do – see top left button). You’ve put an announcement in every newspaper (if your area still has newspapers), every local website, every arts website, your personal Facebook page, your show’s Facebook page, your Twitter account, your LinkedIn, YouTube, Tumblr, Flickr, and Instagram pages. Great. But there’s one social network that you forgot – actual living human beings. The people working on your show have a vested interest and a stake in the success or failure of the production. Why not put them to work? Buttons are a great way to get the word out about your show. Turn your cast, crew, and supporters into walking, talking advertisements. Shirts are great, but you can’t wear the same one everyday. I mean, you can, but for the most part you shouldn’t. It will start to stink after a couple of days. And then you’re just the guy that wears that nasty shirt. Of course, if you’re like most people, you’ll wear it once (or if you push it, twice), and then have to wash it. Which means that promotion for your show is limited to once or twice a week. Besides, everybody wears t-shirts, and a lot of people wear graphic Ts that only get a slight glance. Blending in is not great for promotion. Inexpensive. Portal. Adaptable. Eye catching. A button can be worn every single day with almost any outfit. I wear mine with jackets, suits, t-shirts, dress shirts – anything really. They’re a fantastic accessory because they’re colorful (or should be). If it’s an interesting design, it attracts attention, and people will want to know what it says or means. That is your opportunity to talk up the show to anyone who will listen. You essentially become a walking billboard. They work best if you’re doing a show locally and your cast and crew will be interacting and mingling with the potential audience members. But local shows can still pull in a few hundred people if advertised properly, so never discount them. They’re also great souvenirs for the people who work on the shows, and excellent memorabilia for your personal home museum. Cost is minimal. It’s usually a few cents per button, depending on which company you use. I just bought 100 for 38 bucks – that’s 38 cents per button. Sell them for $1 at the show, and you’re looking at a profit of $.62. So, and math isn’t my strong suit, if I sell all of my buttons for $1, I make a profit of $62. If you add in the promotional value and the souvenir value (so they remember you – not to mention that every time your patrons wear it they’ll be advertising for you), the value continues to rise. Make sure they are eye catching and interesting. It needs to attract attention so people ask about it. You want it to be unique enough to wear after the show. It should be colorful, with a simple design. 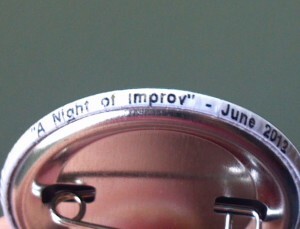 Put your website and/or the name and dates of your show around the outer ring. It won’t interfere with the design, and it publicizes your organization. Find the best company with the best quality and the lowest price. I use wackybuttons.com. They have superior quality printing, my designs come out perfectly, and they ship very quickly – less than a week from order to doorstep. This may not be the company that suits you, so look at your options. Give one – don’t sell one – to everyone in your cast and crew, their families, and anyone else that is involved with the show. If each of those people get just one person to come to the show by way of button interest (I just coined a term), that value far outweighs the $.62 profit you’ll make by selling the button. Have any other unique promotion ideas? Let me know.